Krisztian Magori shares his preliminary analysis of the potential distribution of the longhorned tick in North America and the United States, based on extrapolating a simple rule-based climate envelope model developed for New Zealand. I’m sure many of you have heard about the new invasive tick in the United States, the longhorned (or cattle or bush) tick, Haemaphysalis longicornis. For those who have not, as a quick recap, it was first detected in Hunterdon County, New Jersey, in August 2017, from sheep. Despite our best hopes, it overwintered and was collected again this spring, and then all throughout the Atlantic coast, in 19 counties across 8 states (NC, AR, WV, VA, NJ, PA, MD, NY). They have been found on livestock (sheep, cow, horses, goats), wildlife (deer, opossum), dogs, off-host questing on vegetation, as well as on people. Subsequent investigation uncovered that a tick collected from a dog in 2013 in New Jersey was misidentified, and was in fact this same species, so might have been around ever since then. Now this tick is interesting for a number of different reasons. First of all, it’s not native to the Americas. It originates from eastern Asia, such as northeastern China, Japan, the Koreas, and far east Russia. It was then introduced from Japan into Australia, New Zeeland, and many Pacific Islands. There it is a major pest of livestock, known as the bush or cattle tick, causing severe anaemia and hide damage in cattle. Part of the reason for that is the intense infestations that it can develop on an animal, due to its ability to reproduce parthenogenetically (i.e. females can reproduce without males). It can also transmit Theileria orientalis, which is an obligate intracellular protozoan parasite, which can lead to severe and life-threatening anaemia. In addition, it can transmit several human pathogens, such as the bunyavirus responsible for Severe Fever with Thrombocytopenia Syndrome, as well as Rickettsia japonica. Since it’s introduction, many excellent reviews have been written on this tick itself and the danger that it poses to both livestock and people. My aim here is not to duplicate these writings. 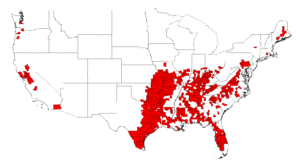 Reading the reports and reviews about the longhorned tick, I started to wonder whether or not it would be likely that I would encounter it in my neck of the woods, in the Pacific Northwest. None of the press releases and situation reports that I read mentioned the potential range and distribution of this tick in the US, and guidelines urged everyone to be vigilant and look out for this new invader. Searching the literature also did not reveal any scientific publications that predicted the likely range and distribution of this tick in North America. However, I did find a paper detailing the development of a rule-based climate envelope model to predict the current range and likely expansion of this tick in New Zealand due to climate change. This climate envelope model basically colors areas on a map depending on whether or not certain climatic criteria (annual mean temperature > 12 C degree, July minimum temperature > 2 C degree, July maximum temperature > 12 C degree, annual precipitation >1000 mm, altitude < 300 m, frost < 50 per year), and counts for each area how many criteria are met. Areas where more criteria are met are deemed more suitable for Haemaphysalis longicornis. While this method is very simplistic, it is fairly easy to implement. If we assume that the ticks introduced into the US have the same habitat requirements, we could apply the same rules in the US, which should provide with us with an educated guess for the areas suitable for this tick. Lacking the information for a better alternative, I decided to try exactly that. Briefly, I downloaded climatic variables for North America at 2.5 minute resolution, applied the rules listed above (with the exception of the frost rule), and created a composite image representing the habitat suitability for Haemaphysalis longicornis across North America. This habitat suitability ranged from 0 to 5, with 5 deemed highly suitable, and 4 suitable. I overlaid the 19 counties in which this tick has already been found in order to validate the model, and took the average suitability of these counties as a threshold above which a county is deemed suitable for the establishment of this tick. I then used USDA 2012 Census of Agriculture data to identify the counties that are suitable for this tick and have substantial livestock (more than 10,000 cattle or 1,000 sheep), to indicate where significant economic harm is likely. If you’re interested in the specific details, you can read that in my preprint. I found that substantial parts of North America are highly suitable for the establishment of Haemaphysalis longicornis. These include much of the Southeastern US along the Atlantic coast, as well as along the Gulf coast, in addition to the Caribbean islands, and coastal Mexico and Central America. Washington DC, Louisiana and Mississippi had the maximum habitat suitability (5). Much of the eastern US, and the Atlantic coast of Canada were deemed suitable, as well as isolated areas on the Pacific coast, such as the Central Valley of California, in addition to both coasts of Mexico and much Central America. Interior parts of the Western US and Canada were generally less suitable, due to insufficient precipitation and high altitude, as well as cold temperatures, and their combinations. In the US, parts of Idaho, Wyoming, Montana and Colorado were the least suitable for this tick. I also found that large numbers of livestock are held in counties in the US that would be suitable for the establishment of Haemaphysalis longicornis. 24,264,730 heads of cattle are held in 703 counties across 28 States, mostly in the eastern US, but some in California and along the Pacific coast, that would be vulnerable for infestation by this tick if it would establish there. In addition, 536,591 sheep and lamb live in 165 counties across 27 states, roughly in the same areas, that would also be suitable for the establishment of this tick. The map of habitat suitability does not perfectly match the 19 counties in which Haemaphysalis longicornis has already been detected. This could be simply because the habitat requirements of the ticks introduced to the US might not exactly match the habitat requirements of this tick in New Zealand. Many of the ticks detected were collected from livestock, pets and wildlife which could have transported it from the location where it attached. Also, I conducted this analysis at the county level, but even in a county that on average does not look suitable, there might be pockets of areas that are highly suitable. Unfortunately, I do not have access to the exact locations where these ticks were detected, and therefore cannot conduct this analysis at a higher resolution. Finally, it is quite possible that extrapolating habitat requirements from New Zealand to the Americas is just not the right approach. Ideally, having information on the exact locations where the ticks were detected would allow the investigators to use a more sophisticated approach, such as maximum entropy niche modeling, to determine the habitat requirements of these ticks, and use those to create a map of predicted spread and distribution. I’m pretty sure there is a group of researchers working on that question right now. The maps and results I produced above are necessarily less accurate and reliable, and serve only as preliminary results until such studies are published. However, for now, they provide an educated guess for the potential distribution of Haemaphysalis longicornis in North America and the US. If you’re interested in more detail of the methodology, please read my preprint, and if you’re so inclined, take a look at the code. I’m looking forward to your comments!